Some fifty years later, and a move to the Canadian Arctic, a world of pristine wilderness, wild flowers and the infamous snow and ice is where my Spirit Guide took me and I remain here today. The first few years were most difficult, transition to the eight month winters clothed in darkness sapped energy and enthusiasm. The search for a decent job compounded the frustration and stress. While leaving the hectic pace of big city life was a welcome relief, my mother and I found that first year difficult at best. So much so that we planned our move back to Ontario at the end of that first year. “Loki’ my Spirit Guide had other plans for us, my journey with him, only in my dreams at that time, continued and deeper and deeper he led me into a world completely foreign to me. “This place was far different from anywhere he had taken me before. It was desolate, barren and terrifying. Winds beat upon my face, blowing snow and ice crystals stinging my eyes, and his image began to quickly fade in the swirling winds. “Excerpt from “The Journey”. We did move that year, surprisingly further North, and it is in the town of Hay River, NT that we settled permanently. Little did we know then, what we have come to know now. Little did I know that I would take on the battle of my life and win. I was told that “no one cares”, that “it will never happen”, and that “you are wasting your time”. Disparaging comments, but I never gave up that three year fight, why, because Loki had shown me in our journey. “It was then that I realized that the cries of agony which surrounded us were the many voices of the innocents who had suffered without mercy at the hand of mankind. I was hearing the voices of those who had come before, the voices of those in the present and the voices of all of those who will continue to suffer in the future.” Excerpt from The Journey. I made a promise to him and with the Grace of God I was determined to keep it. 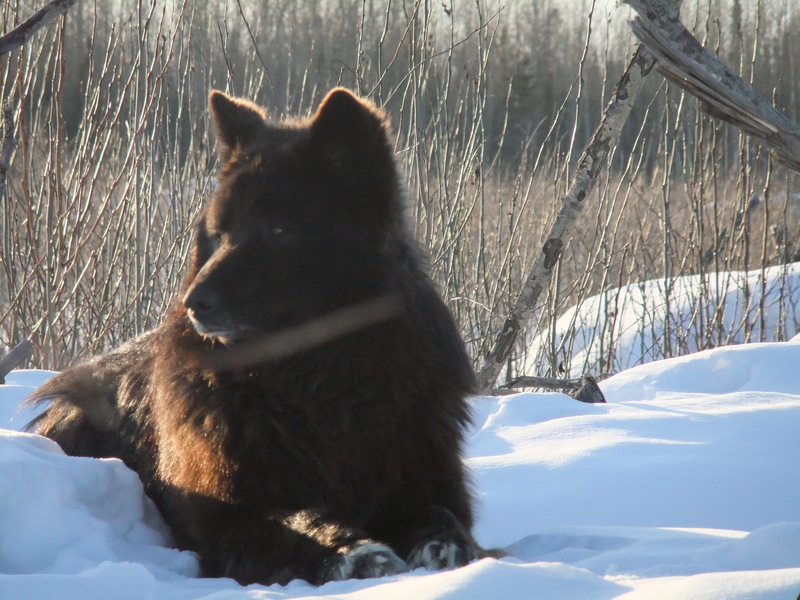 After three years of battling the Territorial Government, the first Animal Protection Legislation in the history of the Northwest Territories became law in May 2011 with the new NWT Dog Act. It was during this struggle that I met for the very first time, the true Loki. 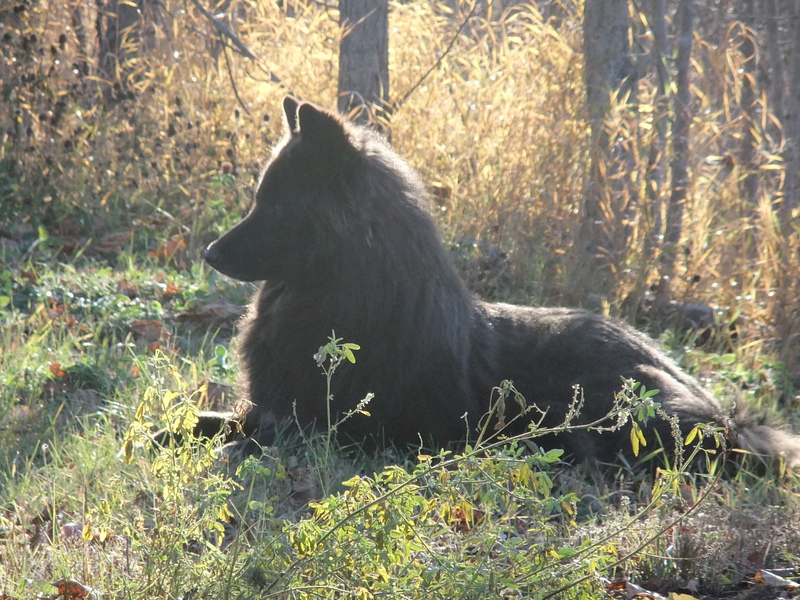 Not the black silver tipped wolf of my dreams, rather a young innocent who through no fault of his own found himself living wild, likely terrified in this vast wilderness and had through his courage and will to live, escaped the death that met others of his kind. Three years have passed since out first encounter, he and I have shared many frigid winters and hot glorious summer days together. That was then and now I have, by God’s Grace, and the help of those who “dared to believe” kept my most important promise to Loki. A promise that would see him forever safe and forever loved by his own family. From this scared and extremely cautious youngster, to this now beautiful and amazing gentle spirit, Loki has given me so much more than can be expressed in mere words. For all who Dare to Believe, Loki is Living Proof that with trust, faith and commitment, the Impossible becomes Possible. All of us who have dedicated our lives to the rescue, foster and rehabilitation of the innocents know that we must be cautious in introducing a new member to our family. We are keenly aware that transition for the newcomer is something that cannot and should not be rushed. We are also keenly aware that transition for those companions within our home is also difficult. Acceptance by all must be total and complete. We also have experienced the heartbreak of not reaching an animal in desperate need in time, and if he have been lucky enough to do so, we have too often experienced the pain of loss. I was warned and cautioned that time would be long and that a great deal of patience would be needed for Loki to transition to his new life within my family. Determined not to break his spirit, I allowed him to make his own choices. Despite being urged by so many to bring him into my home quickly as winter approached, I knew that Loki himself would make that decision on his own. 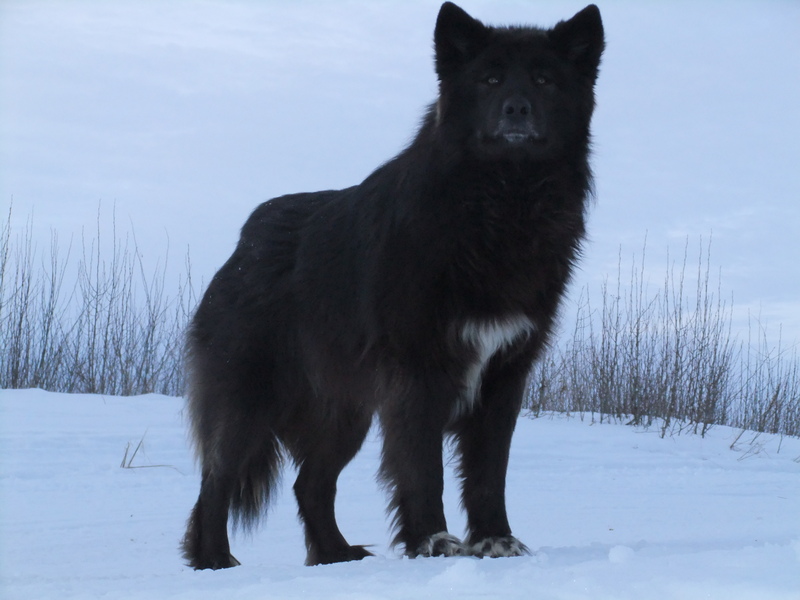 One cannot, without devastating effects, force their own will upon such a Spirit who by his own intelligence has survived in the wilds of the Canadian Arctic, for as long as Loki did, . Now I can, with much joy, say that Loki made his own choices. A New Chapter in our Journey has begun, where it will take us remains a wonderful mystery. I do know that we will take this journey together wherever it may lead us. After all Loki is my ‘Spirit Guide’ both in my dreams and now our reality. There are also many Blog posts here as well. 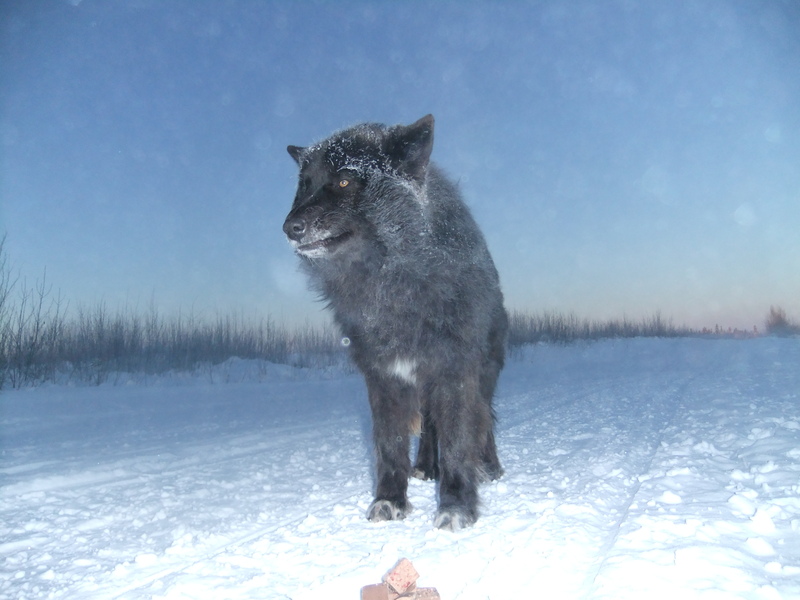 I must let you know that the town officials plan to go after him again and I fear that the outcome will see Loki as just one more dead dog amongst thousands in the North. I raised the funds needed to purchase a dog run for him, donations came from Ontario, Quebec, Texas, Mexico, Alberta, BC and a few from here. The plan was to dart him, have him brought here and I would work with him closely to rehab him and allow him to live out his life in safety as part of my family. The pen was only going to be used until he would allow me to handle him. Unfortunately the first darting attempt failed miserably, the dart failed to discharge the sedative and poor Loki was in pain for three days as the dart remained stuck in his shoulder for 3 days before falling out. 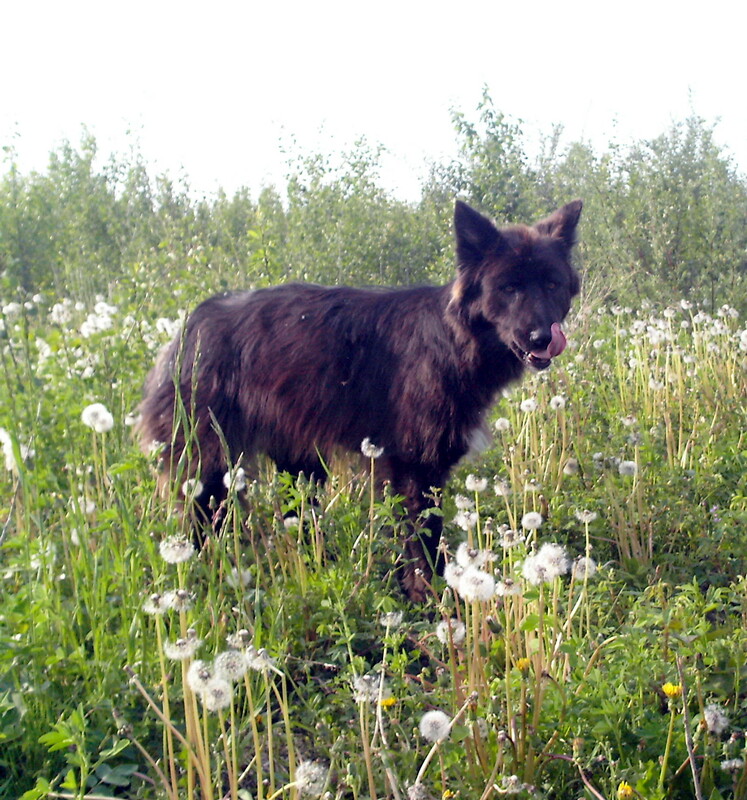 That fateful night, Anna, her daughter and I spent almost 5 hours searching the bush behind my place trying to find him. When I finally did, I followed him for yet another hour and could not get close to him. He was terrified. I had to give Loki antibiotics hidden in his food for almost 3 weeks, Another friend of Loki’s helped in that, giving him his morning dose while I gave him his evening dose. The second darting attempt saw the dart deflected missing Loki so that failed, and the third attempt, (Wildlife Officer) could not get within range. All of this took place during July. The last darting arrangement was cancelled at the last minute by the Wildlife Officer and no further help has been forthcoming to help me get him here. I have idea why. 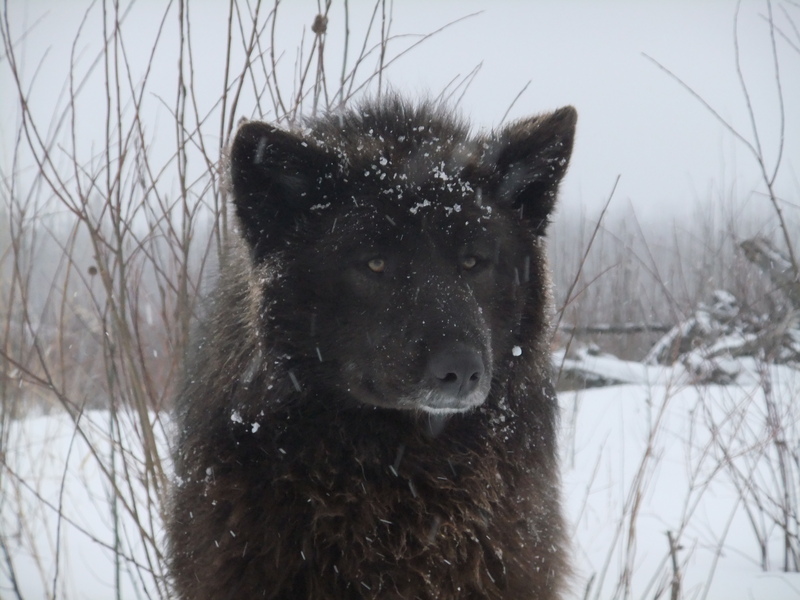 When I contacted the Wildlife Officer, and town officials , basically saying that due to unanswered emails and calls made to the Wildlife Officer, that I and others could only conclude that Loki was going to be allowed to live out his remaining days in freedom. Only one person to responded, Mr. Potter, stating that this is not the case and that they want to see Loki’s issue resolved by the end of September or sooner. In other words if I do not have him here they will take the manner in their own hands to get him off the streets and we know what that means. Those whom I’ve spoken to who support Loki are outraged. His Facebook followers across Canada, here, the US and on the International scene are outraged. I was informed me that some complaints about Loki have been made and that some people in town have implieds of shooting him themselves. Those that do not know him as the rest of us do, as a gentle friend, are intimidated by him, because they have not taken the time to know him and are totally ignorant of his gentle ways. I need people who do know him to stand up and fight for him in order to save his life. Those that have sung his praises need to contact Town Hall and attest to his gentle ways, state clearly that he is non aggressive, lives quietly and that they enjoy his company when he is with them. In summary the target now on his back must be removed and his life must be protected. I even submitted a small petition to Town Hall, attesting to his gentle an unassuming nature and suggested that Loki be made the Town Mascot. 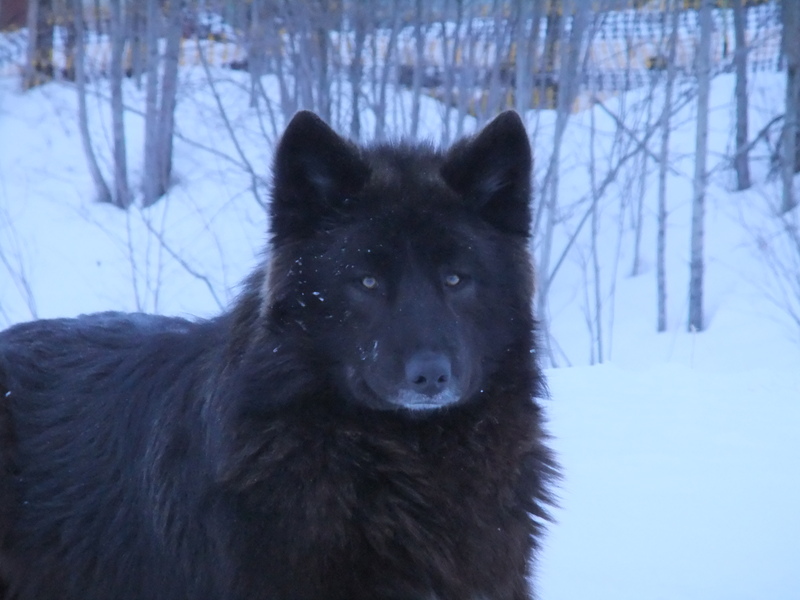 As the sole surviving pup (one of the 23 seized in the Hay River Hoarding case of 2010) Loki has survived free and cared for by those of us who dearly love him. The 22 other pups, rather than be relocated as I offered to do in emails and letters to the Town Officials in June 2010, were secretly removed from the shelter and destroyed in mid August 2010. My offers to relocate the pups to properly equipped professionally run rehab shelters out of territory were not even acknowledged by town officials. Those pups were murdered needlessly. 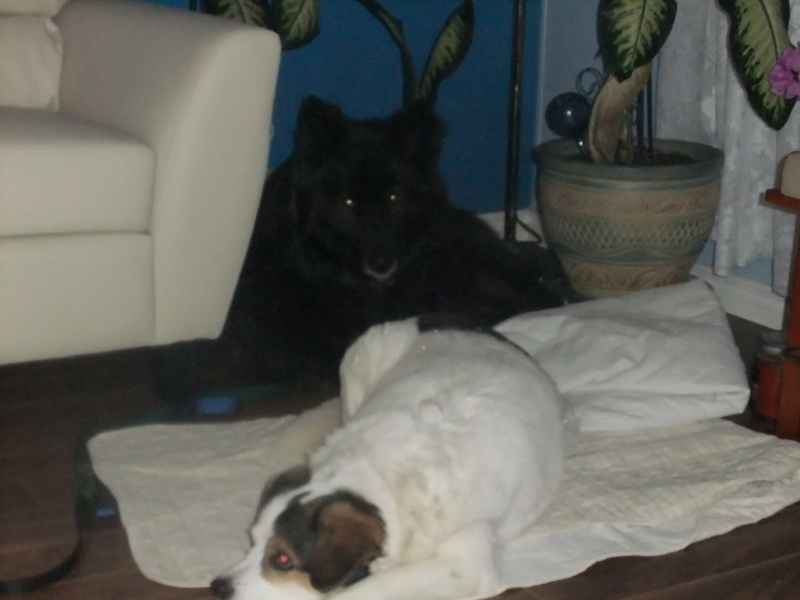 Only Loki survived because he escaped the shelter twice prior to the destruction of the puppies. (Means of destruction is a big secret but I do know that no vet was present) (reliable source information provided). I have done everything humanly possible to insure his safety for three years. 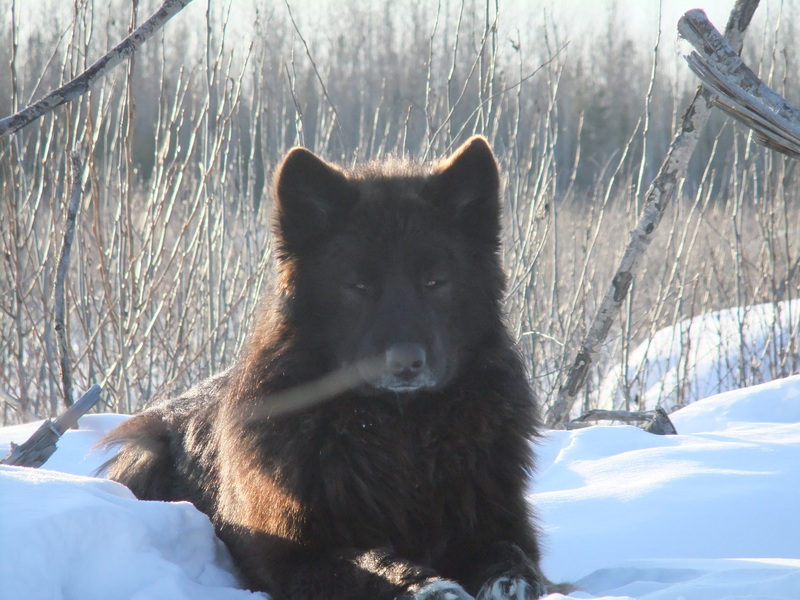 Spending time with him in the bush in sub-zero temps, out in my own yard with him no matter the weather or temperature often up to 4 times daily during winter. I raised the funds needed for the dog run, medications, sedatives, equiptment, bug protection netting for the dog run, collars, harness, leads, pet bed and blankets..all is ready for him here, but now what help I was getting from the Wildlife Officer is non existent and I have no idea why. I really need people to speak up and defend Loki, to plead his case so that he can live out his life in freedom. I pray that you will speak for him. Loki spent the first year of his life caged (I have pictures to prove that) and has only enjoyed his freedom since escaping the shelter in 2010 after having been rescued/seized in May 2010. He deserves to live, he escaped the shelter twice, has survived 3 harsh winters, is loved by so many worldwide and in town and he united total strangers around the globe who came together to raise the funds I needed to prepare for his life here with me. Short of a miracle Loki will become yet one more victim of total indifference. Since I alerted everyone to what is happening concerning Loki and the very real impending actions that town officials may take, I have been receiving countless emails and Face Book messages in support of Loki. For that I thank all of you sincerely. With your permission I wish to copy and past these messages and comments to a single Word doc which I would like to send to the Powers that Be, as testimony to how much Loki is loved and supported. 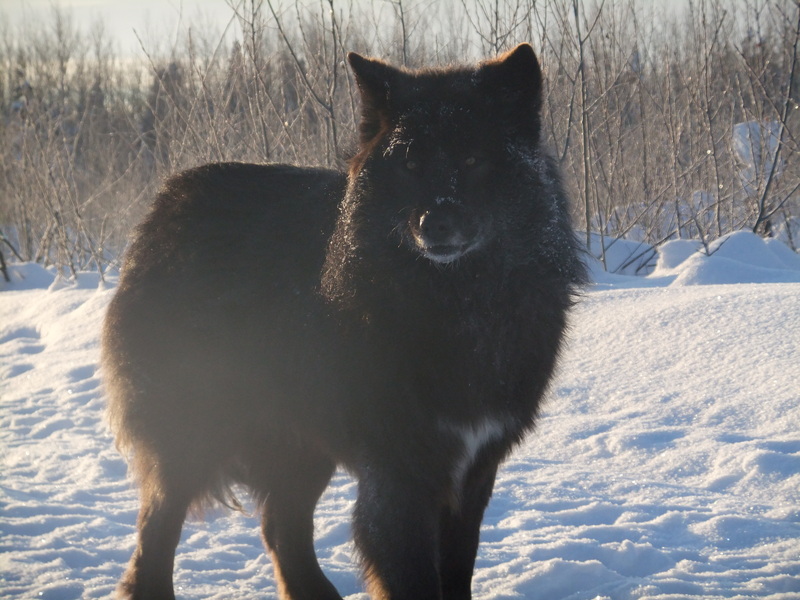 I would also ask that all of you who support Loki, to contact directly Ross Potter and Andrew Cassidy (Mayor of Hay River) personally by email so that you may plead Loki’s case. While I must acknowledge that complaints about Loki have been received at Town Hall, likely from persons who are ignorant of his gentle ways and lacking in his friendship, those who just don’t like dogs period, and those who are intimidated by his stature and who failed to get to know him…I must also acknowledge the fact that Loki is loved by so many, that those whom he has chosen to share his life with want only the best for him, that he has united so many strangers from around the globe who have rallied around him, and he has also as a dear Ontario friend so accurately stated he has put Hay River on the map. 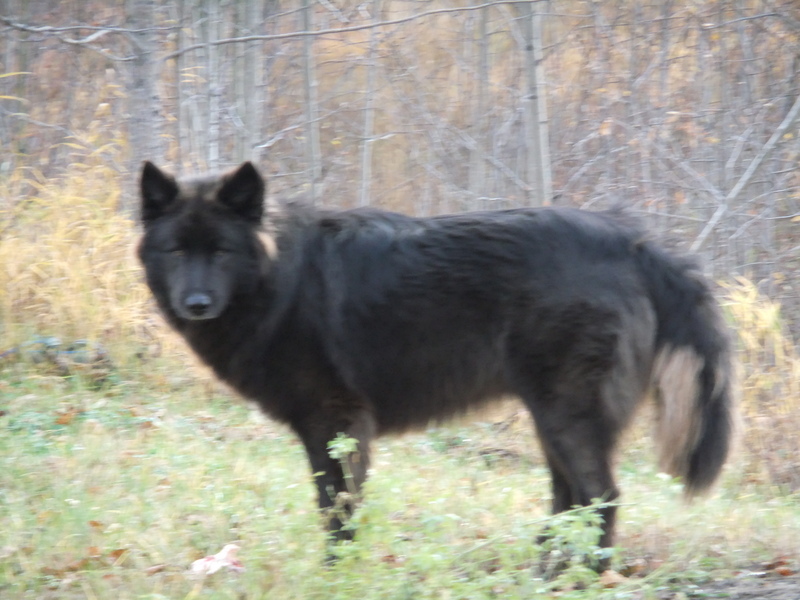 With no further help coming from the Wildlife Officer and officials wanting this situation resolved by the end of September or sooner, time is running out to plead Loki’s case. I need everyone to contact those persons listed above, a blitz if you will, so that the Powers that Be will see that Loki should be allowed to live out the rest of his life in freedom and not become one of the thousands in the NT who have been slaughtered. 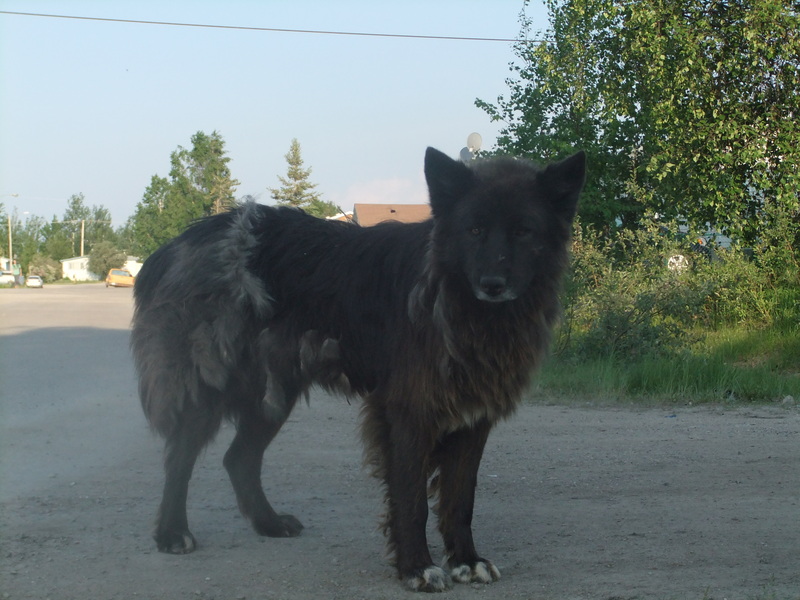 I have in the past via letters, suggested that Loki become the Town Mascot, which would make Hay River noted for compassion and become a leader to other northern communities for being a community that values even a feral animals life. Proving that a bullet is not the answer! Thank you to all of you. You are all amazing, and it is from all of you that I gain renewed strength for this ongoing battle to protect Loki. A couple of weeks ago I put up the poster in order to raise funds for LOKI. 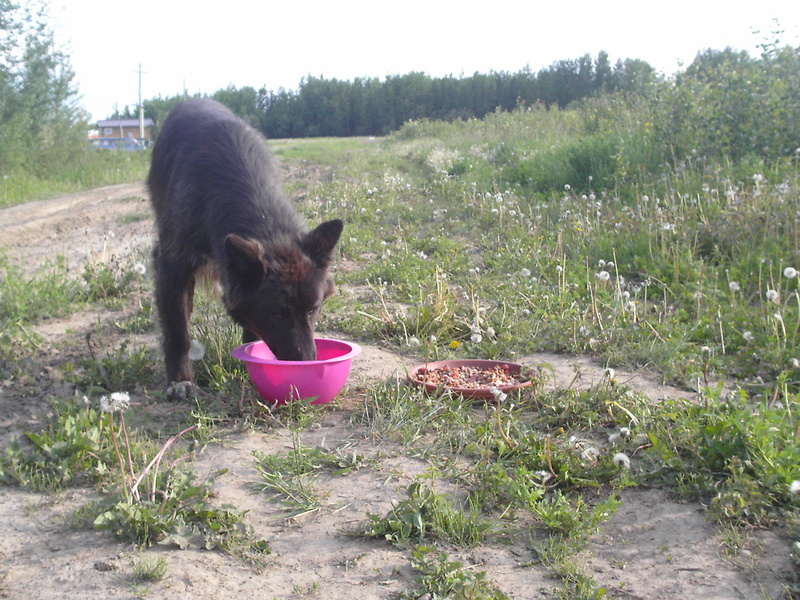 A deadline date had been given to me of May 31st to get him off the streets of Hay River, NT. Thankfully I was able to obtain a time extension from Town Officials. 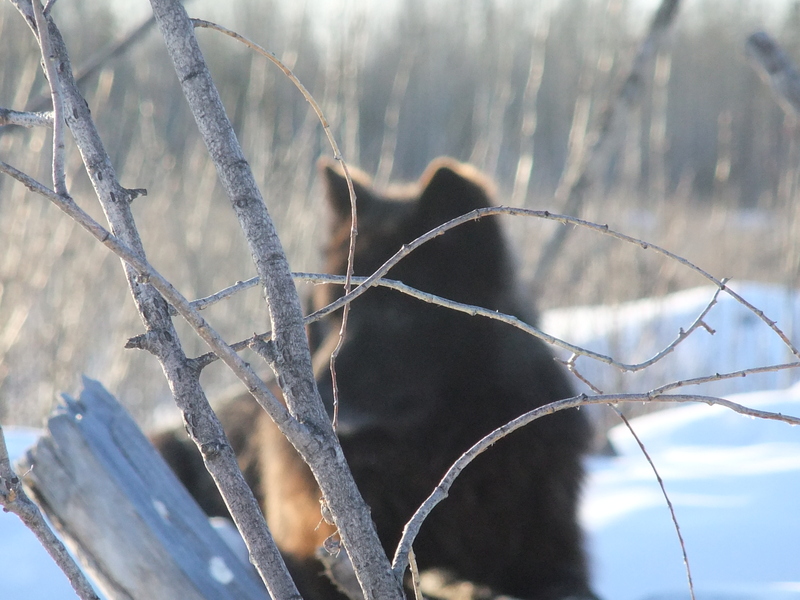 Darting of Loki was planned for this past Friday, June 1, however the ENR Officer who will be darting Loki for me, came by the house mid afternoon Friday, and due to the number of calls he had to go out on concerning bears, as well as lynx, the darting of LOKI was postponed. New time and date is yet to be set up. LOKI was here yesterday, actually wanted to know what I was doing in my storage shed, he is the curious type. He also joined in the walk with ‘Henri’, and the two young ladies walking their kids in their strollers, yesterday. The women live a few doors down from me, and Loki regularly walks with them when they take the kids out. He looked so proud and happy, trotting in front of them, head and tail held high. He had a good brunch and long drink of cool water in my backyard with me yesterday, and I was with him on Friday as well. The ENR Officer checked out the dog run, and felt I had everything set up well for Loki; I washed out a large pet bed of Hemi’s for him, used $83.78 of the donations to purchase a 20′ nylon lunge line, a 15′ heavy duty tie out, a humane nylon training collar, and a regular wide nylon collar and leash. The lunge line I will use as an ‘umbilical cord’ which will be attached to my person and to Loki so that where I go he will go. I wrapped a tarp around one end of the dog run, on the outside, which will give Loki additional shade and a hiding spot from curious eyes from the road. I also hung the fake wasp/hornet nests in the backyard trees, that deter those nasties from coming around. 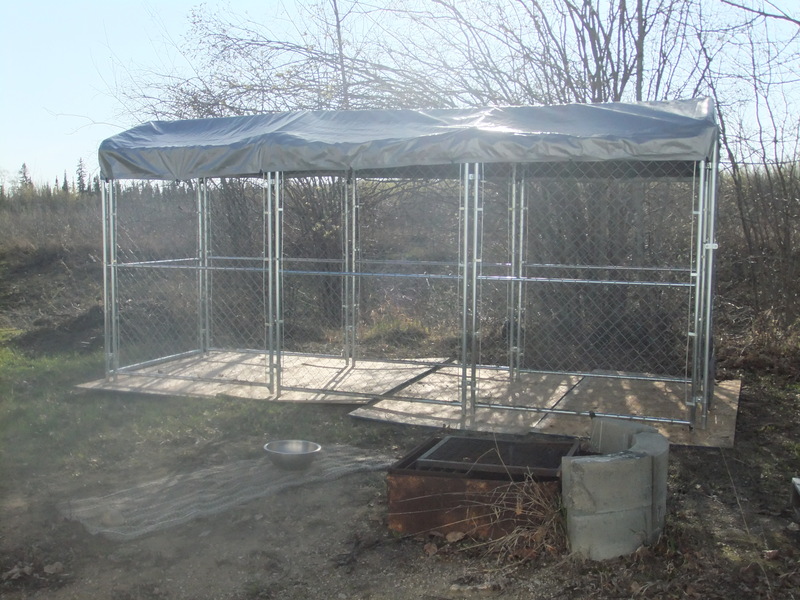 The screening has been ordered to enclose the whole dog run but has yet to arrive. This will keep all the nasties out so that he will not be a meal to those awful bugs. I also cut down and trimmed the trees and cut down the wild roses out back, as I don’t want any of them spreading into the run. Those thorns are nasty. 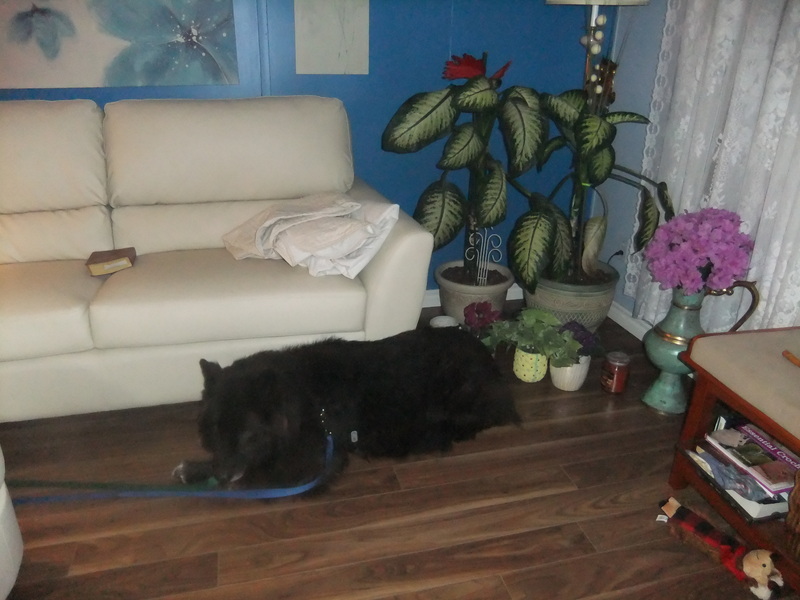 Today I will remove the remnants of the brush, lumber and continue getting the backyard ready for him so that when I bring him out of the run, we will have no obstructions or anything he can get tangled into. 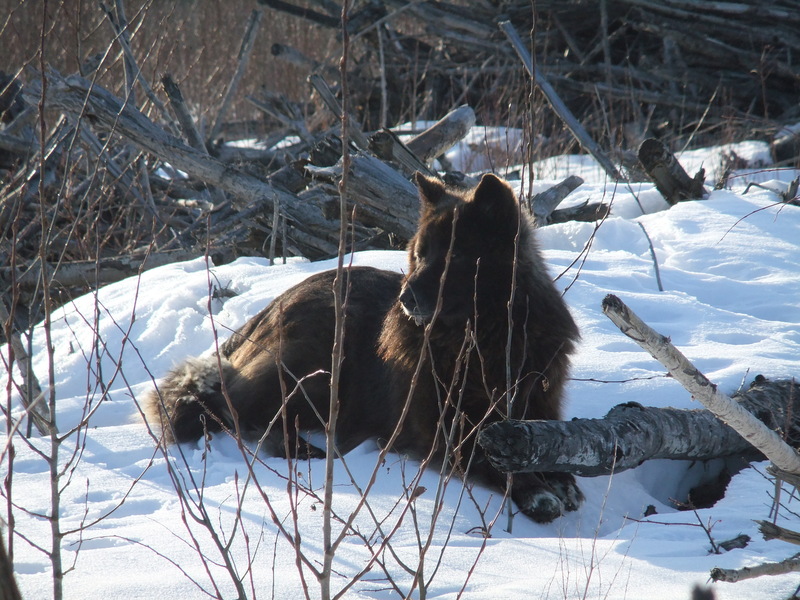 What with the Town extending the deadline date, and with the ENR Officer having to go out on bear calls, it may have been just as well that I did not get Loki here on Friday. The vet will be back mid June I believe, so if darting is still a week away that may be a good thing if the vet is available. In the meantime, I will spend time with Loki as we have been all along. When he was here yesterday he did not seem at all nervous to be eating near the dog run at all..another good thing, he has accepted that it is in my backyard now. I must tell all of you that if it were not for the donations that came in from Ontario, BC and Alberta, none of this would be possible. 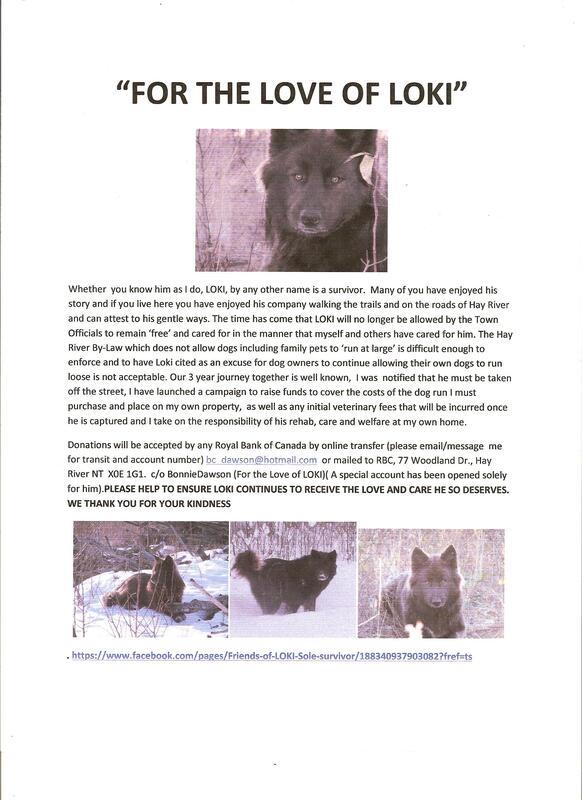 Loki received one donation from a Hay River resident, despite the article being published in the paper here, the posters that I put up everywhere in town and the posters I put on the local online groups here in the NWT. To say that I am extremely disappointed and hurt by the lack of donations here in town and across the NWT is an understatement given the 3 year battle I went through at my own personal expense to get the new NWT Dog Act legislated. 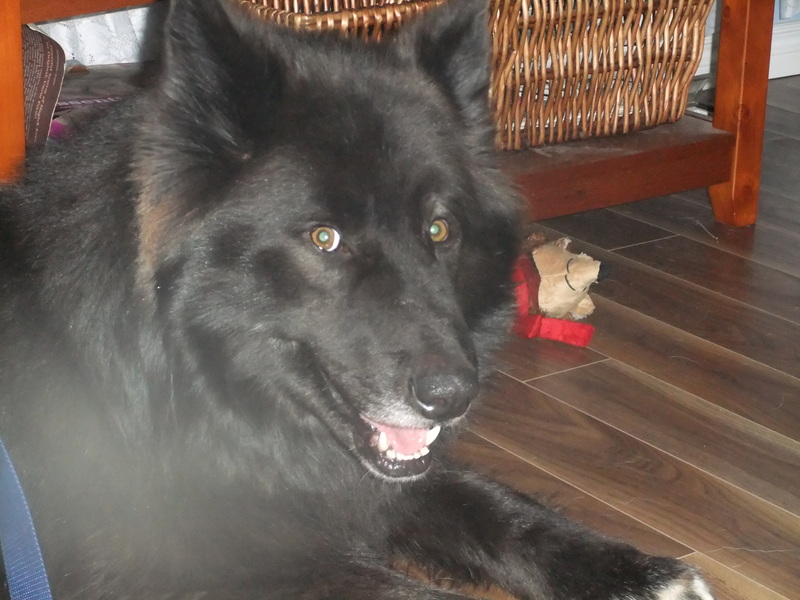 A very special thank you to Darlene, with a rescue organization in Ontario for having held a fund raiser for Loki. Those whom Darlene was able to get donations from have certainly helped this cause. Fund raisers are not easy, they are time consuming, require volunteers and are a lot of work to put together. It is what it is, as they say. Once Loki and I begin this new chapter in our journey together, all will remain in God’s hands, just as it has been since we began our journey in October 2010. Loki has come a very long way from that scrawny scared youngster, he is now a magnificent, beautiful and mature gentle soul, who deserves a loving forever home which I fully intend to give to him. Before the snow flies once again in October, my goal is to have Loki feeling comfortable enough to be bringing him inside, being friends with all my own pets, except I will keep my bunny away from him, and looking forward to the warmth and safety of his forever home. He won’t have to hold up against frigid winds, blowing snow, rains and all manner of crazy weather, alone out there and be a meal to bulldogs, mosquitoes and other nasties. Here in my backyard last summer, we enjoyed quiet time together, and now this will be his permanent backyard, where he will be safe, protected and very much loved and cared for. LOKI wishes to thank all of those total strangers in Ontario, BC and Alberta, he has never met, who have rallied around him, who have made donations, who have put in the time and energy to raise funds for him, he thanks the two reporters who published his story, and he also wants to thank all of you who continue to message and email their support, encouragement and love. First off I wish to thank Lilianna with the Examiner for having done such a wonderful job in putting together her amazing article at the link below. She has included a photo gallery as well as a beautiful video that I took last Fall. http://www.examiner.com/article/saving-hay-river-s-beloved-loki . I also want to thank those wonderful individuals who have enough love in their hearts for LOKI that they have reached into their pockets, and who are emailing and messaging me, with their sincere support and encouragement along with their prayers for both he and I. Donations came in fast and furious at the start, which covered the cost of the Dog run which is now on my property. I will be securing the floor to the run today. The dog run has already been paid for out of what donations came in, which greatly depleted the account set up for him at the RBC. My estimated goal is far from being reached. Having made contact with an ENR Officer here in town, arrangements have been made that this individual who knows LOKI well, as does his young son, will dart LOKI with a tranquilizer in order to capture hm and get him to my property. The sedatives needed must be provided by the Alberta veterinarian and shipped in from Alberta. I do not know as yet what cost to myself this will mean. When asked by the only media reporter in the NWT that contacted me why I was raising funds, I responded by saying …. Being the sole income support for my family, is the reason that this fund raising campaign was launched. The dog run could never have been purchased, had not donations started coming in as fast as they did. A deadline to get Loki off the streets by May 31st has been extended, however, it was not made clear by Town officials how much more time I have. The donations which have come in have been from caring persons back home in Ontario, some from Alberta and BC by e-transfer. Additional Funds are needed to cover the cost of screening to protect LOKI from the horrible insects such as bulldogs who take huge chunks out of anything that lives, heavy duty dive bombing mosquitoes and of course the clouds of sand flies up here. Veterinary costs that will include a complete physical, heart worm testing, complete immunization and also neuter, and whatever else he will need initially. Loki remains at large for now, date scheduled for his darting has yet to be set, as the sedatives have yet to come in from Alberta. Soon his freedom will become lost to him, and the long and patient work both on his part and mine will begin once he is here with me. I promised him from the very start that I would never ever give up on him, and I will keep that promise. 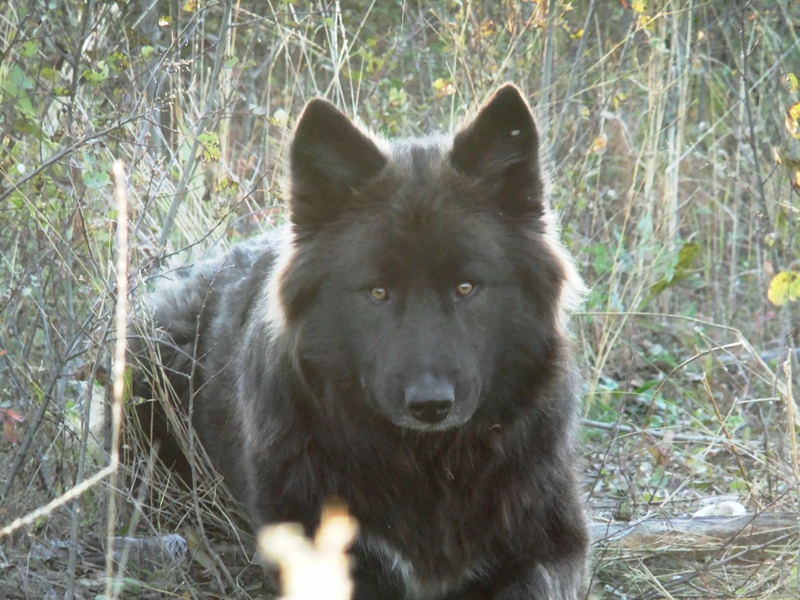 I also promised him just the other night, that we will continue to take our long and beautiful walks together in this pristine Northern Boreal Forest area together just as we always have, only this time he will have to leashed. Loki has never know the warmth of a loving hug, he has never known the comfort of laying beside a warm wood stove on a frigid winters night, he has never known the comfort of a secure, safe and loving home. No doubt about it, there will be a difficult period of adjustment for him, even greater trust must be built before I will be able to truly handle him, put a collar or harness on him for our walks together. But I will Never give up on him, on us. 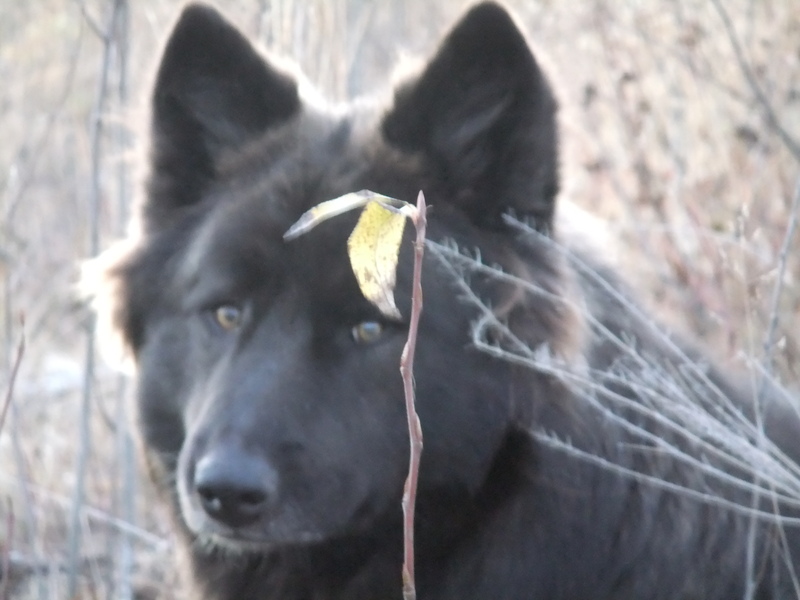 LOKI and I still need your help to raise funds for him. LOKI by any other name IS A SURVIVOR. Now with your help his continued life can be secured in a safe and loving forever home. Checks or money order can be mailed (please personally email me for that information). Thank you. 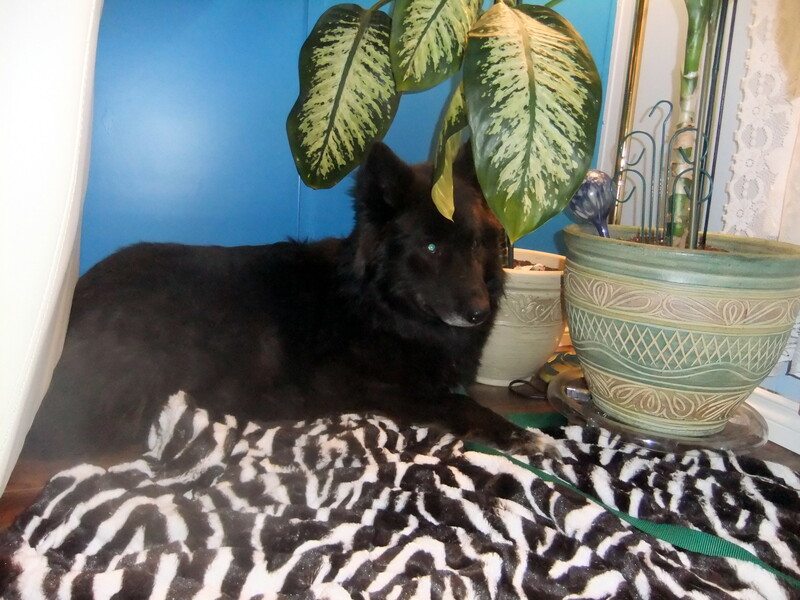 Please help me keep LOKI alive, healthy and safe…to give him the loving home he deserves but has never known. We, LOKI and I, wish to thank all of you who have already contributed, and we thank any of you who are planning to do so. There has been much by way of emailing between parties with reference to the controversial No Kill Movement, and in addressing the issues and conversation that ensued, I have received permission from Ms. West to copy and paste her response in one of her communiques. My own comments are made first and I agree wholeheartedly with Ms. West. Over population is definitely NOT and animal problem. It is in fact a HUMAN problem period! Every single day, in every single town, city and province countless kittens and puppies are born and cats and dogs are either turned into shelters, are found abandoned and dumped. Why, because educating the masses as well try to do, stressing the need for spay/neuter is being totally ignored by the ignorant, the money hungry and the irresponsible pet owners not only in Canada but elsewhere throughout the US and every country on the Globe. It is a HUMAN problem. We see it everyday, and we clean up the mess and horror left behind. As far as the laws governing companion animals in this country, we all know how archaic and antiquated these laws are, yet each time a new Bill is brought before the House to improve the legislation and declassify animals as mere property, it is voted down by the current government in power. Further, shelter funding for the most part is not subsidized by provincial or federal funding and often depends solely upon donations. What municipally owned shelters there are, are dictated to by the municipal bureaucrats who dictate!! Over burdened shelters, and especially No-Kill Shelters trying so desperately to find forever homes for those in need, unlicensed back yard breeders, the human failures of spaying and neutering companion animals, the total lack of responsible pet owners and the failure of municipal, provincial and federal government to properly address the issues of inadequate veterinary services in many areas across Canada, the Federal Legislation, the lack of very real animal protection By-Laws within our communities, municipalities and not having enough qualified, fully educated Animal Cruelty Investigators within each SPCA, town, city, municipality and province/territory is also part of the problem. We need the powers of Seizure to save distressed animals held in the confines of ongoing neglect, disregard and failures to provide the necessities of life. Here in Canada, we need the powers that are given to SPCA’s within the US. Here instead we must depend upon the local police forces for seizure and quite honestly folks they have enough on their hands and distressed and abused animals are the last of their concerns. Major movements within this country and elsewhere, as Sarah has pointed out, must have one focus to be effective Any problem regarding animal welfare is NOT a single faceted one The No Kill Solution is taking the shelters to task. This is one of the problems we have with bad shelter management, lack of cooperation with rescues, not socializing dogs and the list goes on! We have seen the scandals surrounding the OSPCA, my God my computer files are enormous on that particular issue alone. Then you take into account the Whistler case, that massive slaughter was unnecessary and fueled only by greed and a failure to effectively monitor such operations. The subsequent investigation into the slaughter was too little too late, and the outcome of the judgement issued by the Courts for this mass murder was merely a slap on the wrist. WE must, support each other. WE must be united period. WE must not criticize or judge that which is being done by any one group or organization in their fight to end cruelty to animals in this country or anywhere else period. Dissention among the troops proves only to make the army very shaky and ineffective. While one has the right to disagree, and I will defend that right, we all have one common goal and purpose..to save animals. Since the Federal Government shows total disrespect and total disregard, often branding many of us as ‘terrorists’ if we speak out against the lack of very real Animal Protection, cutting off charitable status to organizations that openly oppose current ridiculous antiquated legislation and policies..we have only each other from which to draw strength and resources. If we have groups and movements taking on any of these’ issues of this multi-faceted program…. it is a good thing! No one group can do it all and we cannot criticize each other if any one of us feel that something is fundamentally wrong with a specific group then don’t work with them Keep doing what you are doing, but I feel other than that we must work together as Bonnie says. All of us have to pick one focus and working on creating a dove- tail relationships with others who have a different mandate and focus! It is out of “ combined” efforts that will and do make a difference for all the animals we care for so deeply. We can’t change other countries but we can all come together to do what we can for Canada and her animals and creatures, wild, marine, stray ,farm and companion. It appears that Ole Man Winter is not yet done with us yet. Alberta was getting hammered yesterday and of course the NT had it’s own fair share of heavy snow…so much so that visibility was minimal at best. One cannot complain however, given the horrific devastation other areas around the world have faced, severe tornadoes in the Southern U.S., hurricanes and the like. We are fortunate this far North. The last few days have been balmy believe it or not, plus temperatures saw a melting snow, making it much easier to get to LOKI. Snow is deeper now, but has not affected my determination to make sure he is well fed and safe. 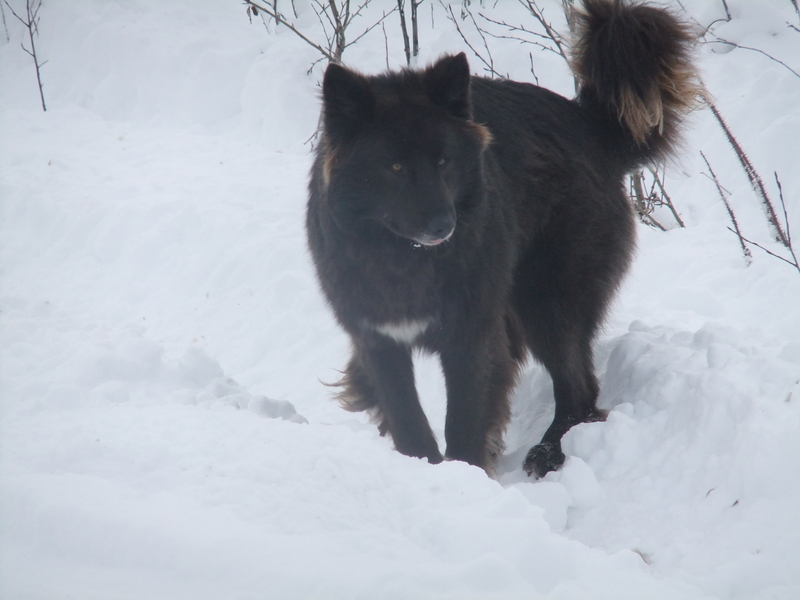 Yesterday saw heavy snowfall, the white fluffy stuff, that is fun to roll around in…and LOKI and I did just that. I continue to be in awe of his gentle and playful nature, his inherent curiosity and the trust we share together. I had brought him out a blanket (which he has taken in the past) and he delighted in his attempts to pull it out from under me as I lay horizontal across it. In the end, he did trot off with one of my handmade hats. These photos were taken yesterday during the snow storm. Despite the storm it was actually a beautiful and pleasant day, if one is dressed for it. 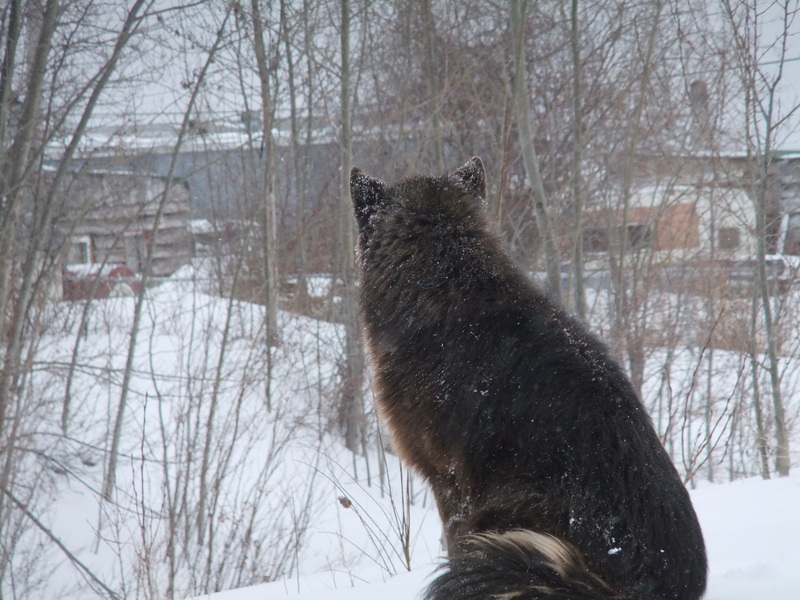 I found LOKI quite relaxed surveying his domain… aware of the swirling flakes around him, yet seemingly unconcerned. 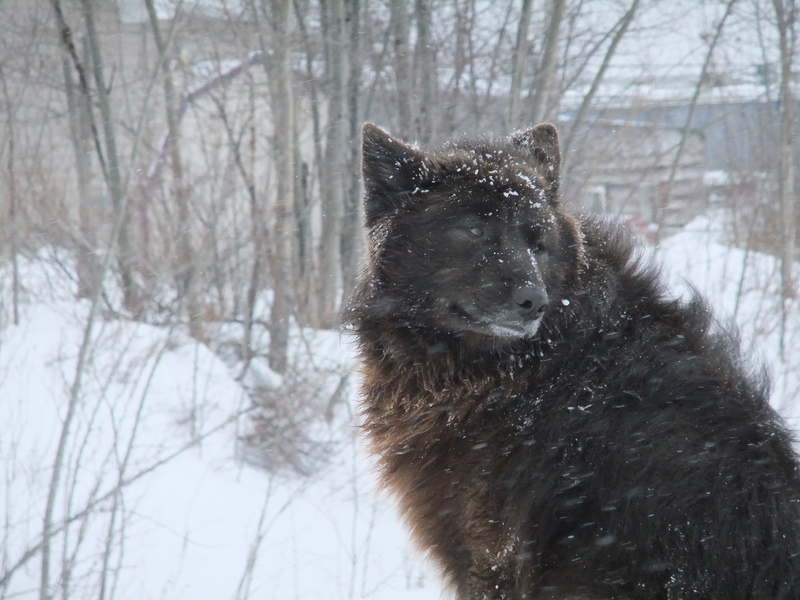 April 4th is also the 8th anniversary of my father’s passing, and I must wonder what my father would think of his daughter today…going out in all manner of weather, slipping, sliding and often falling awkwardly in order to spend time with a beautiful feral wolf hybrid in the middle of the Boreal Forest of the NT. I doubt he would laugh, I know he would not criticize…he bore witness to my lifelong dedication and commitment to all animals and stood by me, regardless to the numbers and species that I would rescue and bring home to care for. I know in my heart that my father would be amazed and likely proud….he would also marvel at the relationship and trust that has been built between LOKI and I. He would consider LOKI to be the gentle spirit that I see in him, and he too would continue to admire his will to survive. Having spent time with him early yesterday afternoon, I was delighted when I went out to top up my bird feeders, and turned around to see LOKI portraying himself as King of the Hill on the large mound of snow piled up from my driveway. Once again we were given the time together that is is very precious. Later in the evening he returned and of course was served a warm meal and fresh water. 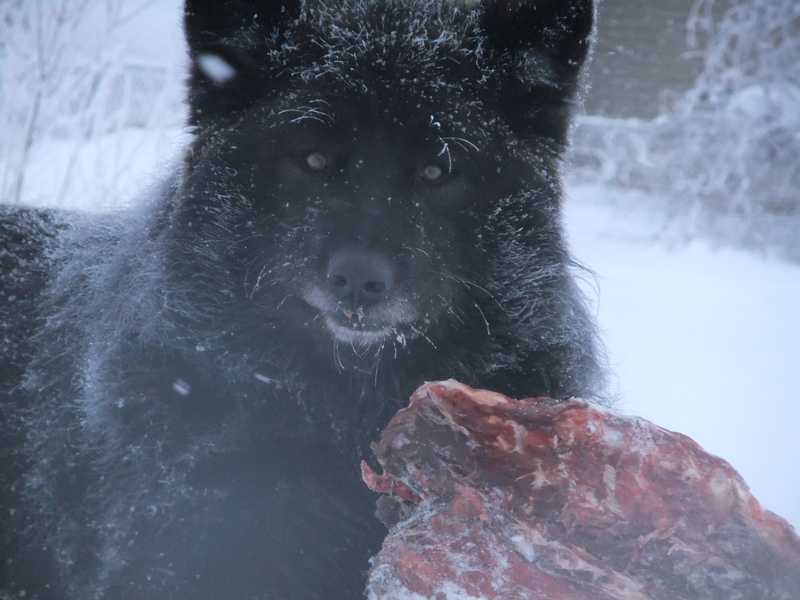 Just a half hour ago, he again gifted me with his presence here at my home, and having trotted off with a large piece of fresh meat, I prepared his plate and crossed the snow laden small bridge to meet up with him in his domain. How did he know? 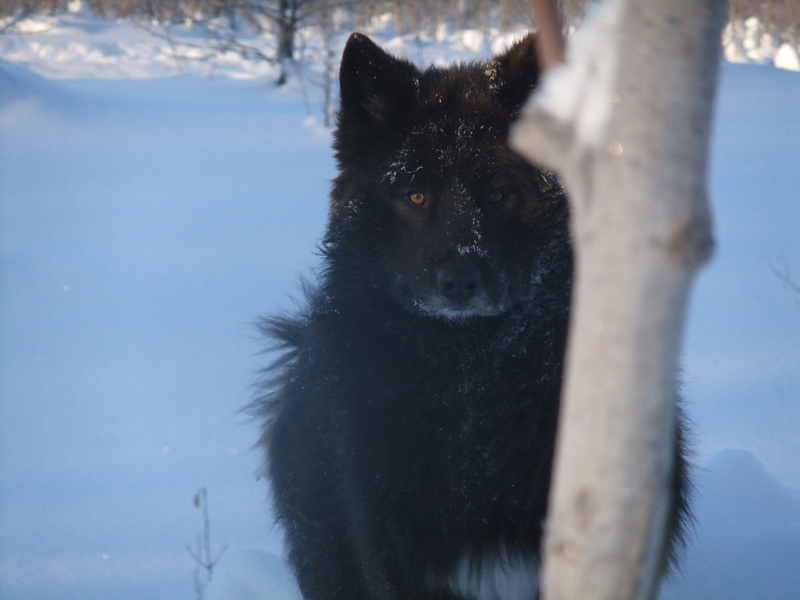 But he did, that I would follow him…he sat patiently watching and waiting as I crawled up the side of the deeply snow covered ravine. LOKI has become, is an integral part of my life. He has taught me so much about who I am, he has touched my inner soul and awakened that spirit within that I embraced as a child. LOKI has also touched the hearts of so many around the world, complete strangers that continue to marvel and to care about his survival. He has brought to me new friends, around the globe, that I will never meet in person. One such friend is Sharon who despite the distance between us, cared enough to mail to me a treasure…a St. Francis medal which I continue to wear faithfully. St. Francis is the Patron Saint of Animals. 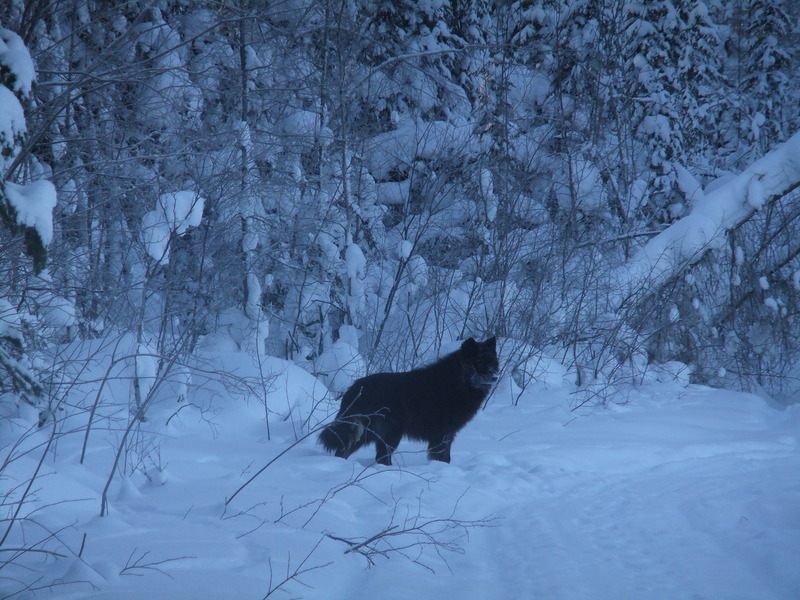 Prior to moving to the North, from Ontario, I had developed an affinity to wolves, seeing in them the true spirit of freedom. In studying First Nations beliefs and traditions, as well as various other cultural traditional beliefs, I learned about the spirit, and what each animal represented culturally. I learned about what is termed ‘Familiars’ those animals that come to one in dreams, that guide us. 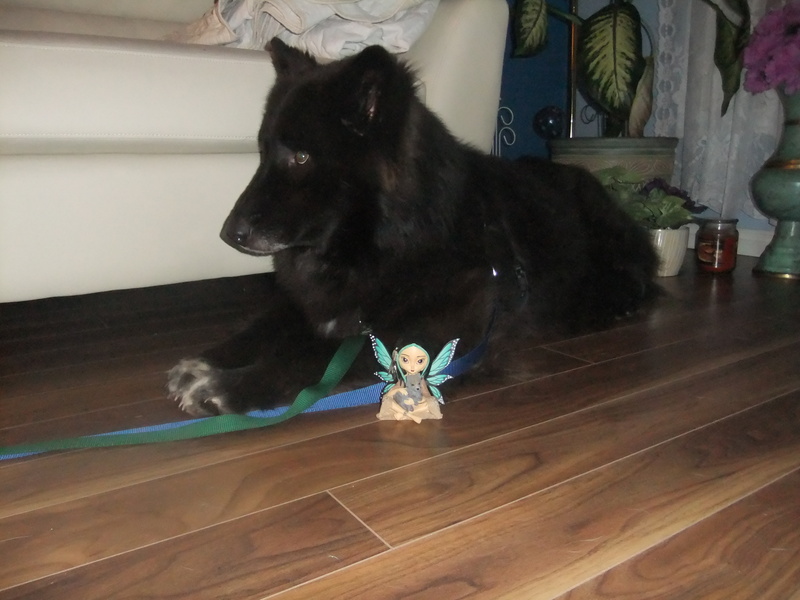 Little did I know that over twenty years later, the wolf that came to me in my dreams, and whom I then called LOKI, would be an important part of my life today. Dreams are said to reveal the soul, and the journeys that the wolf of my dreams and I shared remain with me vividly today. I do not believe in co-incidence, therefore I cannot believe that the beautiful Pewter wolf head that I wear today, purchased as a gift to me from my mother prior to leaving Ontario to head North, is a co-incidence. Friends have told me that it was my destiny to make the journey to the North, leaving the comforts of an established career and lifestyle far behind me. That it was meant to be, that I should be here, that I would fight for the rights of animals and see the new NT Dog Act legislated. Perhaps they are right…..I do know that it took crossing provincial borders and facing a great deal of change to bring me to this place, this time…and to bring LOKI and I together. I shall be eternally grateful for this amazing gift. Hello and HAPPY St. Patty’s Day everyone!!! Sometimes I must wonder that I am in the wrong profession. I should have become a Mail Carrier rather than a Professional Financial Administrator. Last evening we experienced yet another dump from Ole Man Winter, apparently he is not done with us yet. 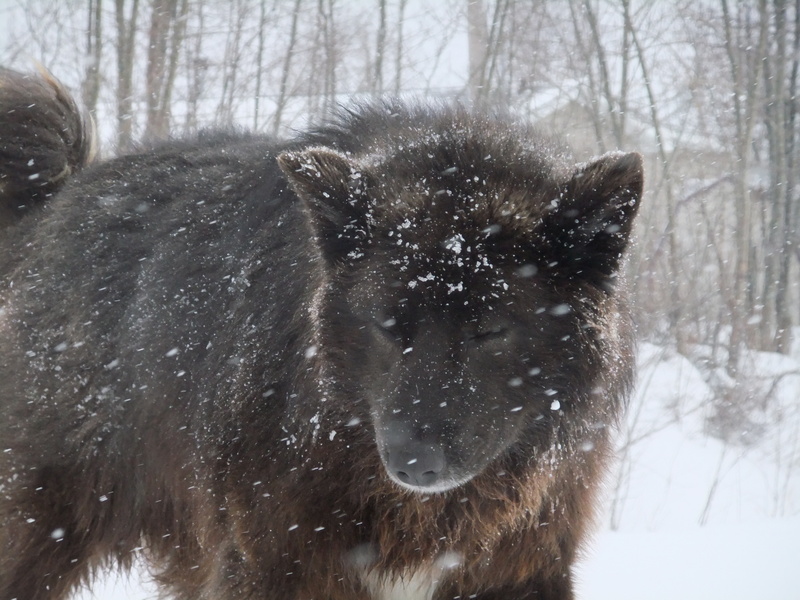 Despite the weather, I had the gift of spending time with my precious LOKI, even as the wind blew the snow around us. It was cold yet not intolerable. Despite his large breakfast earlier in the morning, LOKI was very hungry. Maintaining his body heat requires food, the mere process of digestion aids in this. So like any good mail carrier, warm clothing was put on and the trek through snow was needed to ensure that he would have a good meal to get him through the cold evening winter. This morning that trek was made once again, and he again was very hungry. The snowfall from last night blanketed the ground in a fresh white wonderland. Deep enough to trip me up a number of times, the balancing act not to drop or spill the plate succeeded. No need to coax him today, he came on the run as soon as he heard my voice, he does lately. Knowing exactly what he needs (he is a very smart boy) he chose to eat the chunks of fresh fat and Rollover rather than the chunks of fresh meat. Rollover does have sugar for energy and the fat will be converted to energy and warmth as well. Once again his plate was cleaned, nothing left over. Our newest game of me mimicking everything he does seems to appeal to him. 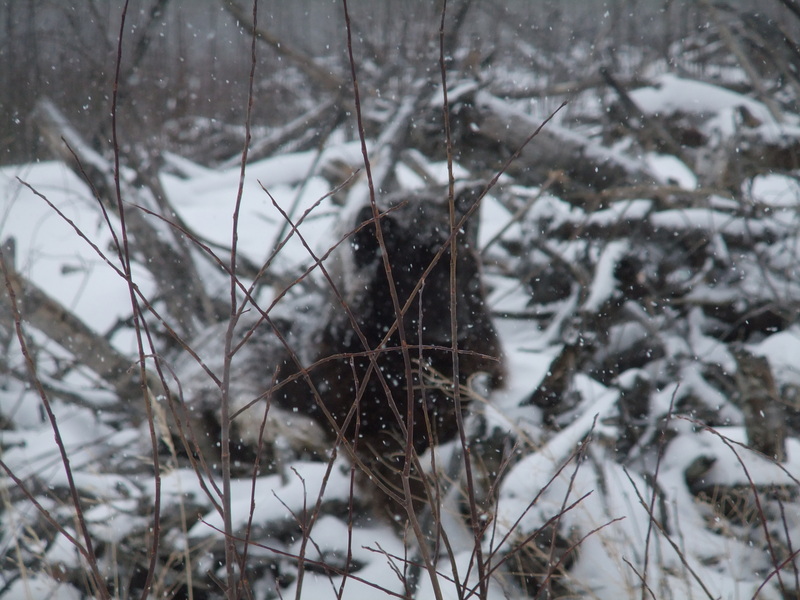 We roll in the snow, on our backs, bellies and sides. He takes the play stance, so do I. He woofs, I woof. He give a little curious whimper, I respond in kind. He throws his food in the air, I throw his food in the air. Am I nuts???? Possibly…but we are both having such a good time together….I really don’t care….I doubt he does either. Our interaction is our private quality time together….right!! I took some amazing videos, however as they would reveal the location of his den, I cannot take the chance and make them public. LOKI surprised me, by allowing me to actually lay with him at the den. A very precious gift of trust that he had given to me. One that I cannot betray. 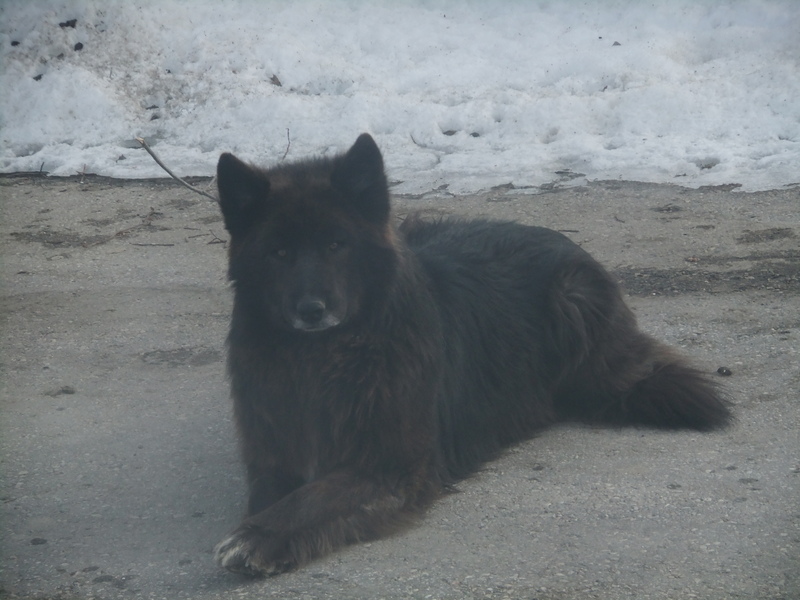 LOKI has come along way from the scrawny escapee from the municipally owned town shelter, his escape in the summer of 2010 meant that he was not killed as were the other 22 rescued pups were. Our journey together began in October 2010 and it continues now, and I pray that it will continue. LOKI is much loved by those who have come to know him, know that gentle sweet soul and spirit. Not only those here, but those around the Globe who have read his story and viewed his videos. The supportive comments and emails for him have amazed me. To all of you, LOKI sends his love to you as well. LOKI is living proof that patience, caring, commitment and dedication to help even just one animal goes a very long way. He is proof of the Will to Survive and proof that often strangers can act as one to ensure an animal is cared for. For those who do enjoy his company, who do offer him food as well…..a very sincere Thank You from the bottom of my heart.